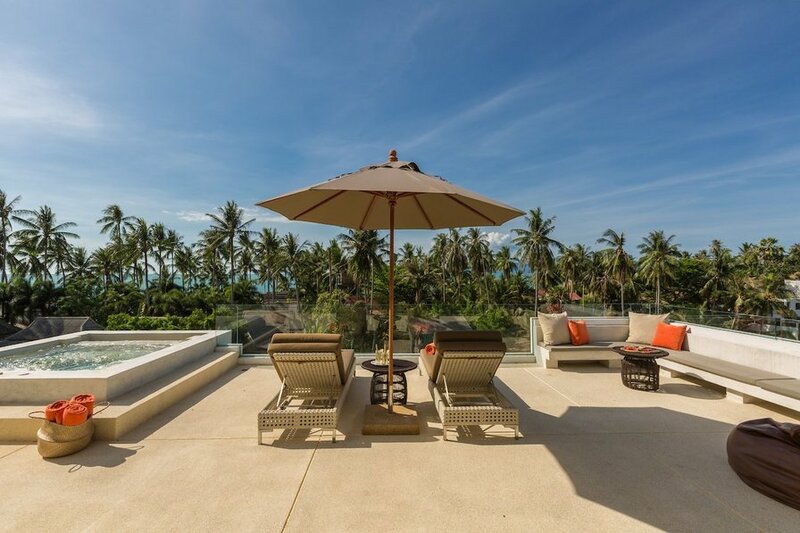 New villa Pina Colada is a stunning brand-new contemporary villa (with 6 bedrooms, private pool, 2 jacuzzis and upper terrace with projector screen) situated only 300 m from Ban Tai beach. Villa is laid out over three floors and has been lovingly designed and furnished to meet every need and wish of the guests. Upon entering the property through wooden doors guests will find themselves in a cozy courtyard with private pool equipped with loungers and framed by sandwash and manicured lawns. Ground floor is separated in two wings. Right wing hosts small hallway and spacious living room which combines a comfortable lounge, dining area, fully fitted western kitchen with breakfast bar, guest's WC and storage room with washing machine. Comfortable sofas sit either side of a stylish glass coffee-table and poised before flat screen TV with Apple TV/DVD/SAT. There is also a pool table adding further to the choices for evening entertainment. Dining area includes wooden table with white-leather seats for 6 persons and stylish breakfast bar with 3 bar stools. Living room has full- length floor-to-ceiling sliding doors which give access to private pool and further to outdoor sala equipped with bar, small dining table for 4 persons and modern gas BBQ. Left wing features two en-suite bedrooms. Each of the bedrooms is air-conditioned, has king-size double bed, wardrobe, flat screen TV with SAT, safe and en-suite shower room. Both bedrooms are equipped with high-quality bed linens, bath towels and decorated with thai modern artworks and paintings. Bedroom 1 has sliding floor-to-ceiling door opening to cozy yard with sunken private Jacuzzi. Bedroom 2 has extra exit to back yard and private adjoining terrace for a relaxing evening tea. Outdoor external staircase leads to the first floor where further 4 bedrooms are situated. All bedrooms are equally comfortable and appealing. They are equipped with TV, air-cons, en-suite bathrooms with rain-showers, basins and wc. Bedroom 3 has private terrace, king-size double bed, built-in wardrobe, safe, en-suite bathroom with rain-shower and double basins. Bedroom 4 includes king-size double bed, study corner and en-suite bathroom with a rain-shower. Long corridor leads to bedrooms 5 and 6. They are similar to all other bedrooms and both have private terraces. Second floor boasts second living room with kitchenette, dining table for 6 persons, leather sofa opposite wall-mounted TV with SAT and guest’s WC. One of the main features of villa Pina Colada is a huge sea-view terrace perfect for parties and chill-out evenings. One side of the terrace has sunken private Jacuzzi, loungers, a corner sofa with rattan coffee tables. The other side of the terrace is equipped with outdoor furniture and screen projector with DVD. Top floor terrace is also a perfect place for yoga sessions. With a range of indulgent contemporary facilities and comfortable but practical spaces Villa Pina Colada offers an appealing blend of private indoor and outdoor luxury. The villa is serviced by dedicated staff of Ban Tai Estate (maids, concierge, chef upon request) so every need is easily catered for and total ease and comfort assured.